Is there a shear instability in metal foams? Last year I spent three months modeling the compressive behavior of aluminum alloy foams. I had hoped to find some evidence of the banding instability that is often observed in elastomeric foams . Lakes writes that this sort of banding instability provides indirect experimental evidence for negative shear modulus . Figure 1. 2-D simulation of an aluminum foam. 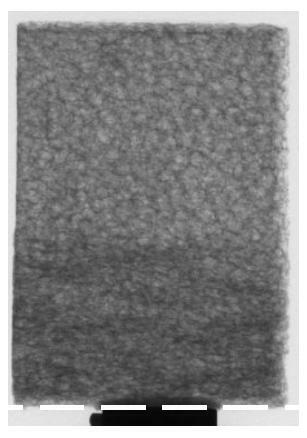 or in experiments on Alporas foam by U. Ramamurthy at the Indian Institute of Science (Figure 2). 1) Shear bands occur only in purely elastic foam materials. 2) A regular structure might be needed for shear bands to form in elastic foams (for example, a honeycomb structure). Does anyone have any insight into this issue? Any theoretical results that can set me straight are most welcome. For more details you can look at my slides (presented at the WCCM conference in Los Angeles last year). See, for instance, Lakes, Rosakis and Ruina, 1993, "Microbuckling instability in elastomeric cellular solids," J. Materials Science, 28(17):4667-4672. 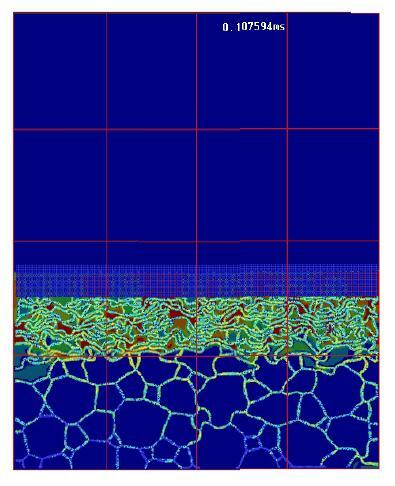 Lakes et al, 2001, "Extreme damping in composite materials with negative stiffness inclusions," Nature, 410:565-567. Permalink Submitted by Henry Tan on Sun, 2007-02-11 23:26. Did you ever try any micromechanics analytical solutions on the behavior of metal foams? Permalink Submitted by Biswajit Banerjee on Wed, 2007-02-14 19:21. When studying the micromechanics of foams, the standard procedure is to select a single cell and study how it behaves under various loads. Usually the cell is considered to be of a regular shape (such as a hexagon). If you do an analysis of such a cell, you'll find that a buckling instability arises that leads to a shear band at an angle to the loading direction. If the band develops when the material is still elastic, it continues to develop when plastic deformation starts. However, I haven't seen any such bands in my simulations of foams with random microstructures. I think it will be a good undergraduate project to figure out when bands form and when they don't. Permalink Submitted by Henry Tan on Mon, 2007-04-09 20:06. Will the occurrence of the shear instability depends on the material properties (aluminum alloy foams) you chose for the simulation? I guess there is a critical material combination that decides whether the instability will occur or not. Permalink Submitted by Biswajit Banerjee on Tue, 2007-04-10 19:52. It is quite possible that you get these bands if the materials are elastic. However, I have not seen any such band during the elastic phase of my simulations. Also, experiments on Alposa foams do not show any such bands. The material model that I have used is an extended Mechanical Threshold Stress model for aluminum that Anup Bhawalkar and I developed and fit to substantial amounts of experimental data on 6061-T6 aluminum alloy. It will be nice to see what others have discovered regarding this manner. I certainly am no expert on metal foams. Permalink Submitted by Henry Tan on Mon, 2007-04-23 17:35. Permalink Submitted by Biswajit Banerjee on Mon, 2007-05-14 19:28. Here some simulations of closed cell aluminum foams for your entertainment. Youtube has flattened the movies quite a bit and the number of frames has been whittled down to reduce the size of the movies. What I've done is to start off with a random distribution of bubbles. The bubbles are pressurized from the inside until the gaps between adjacent bubbles are below a certain tolerance. You can see that the final microstructure resembles that of actual foams. In this video I show can example of unidirectional crushing of an unconfined aluminum metal foam. Note how the cells buckle one by one starting from the top while the rest of the foam remain unaffected. Also note the final configuration of crushed cells. This configuration is difficult, if not impossible, to achieve using standard finite elements. My simulations were performed using the material point method (GIMP). This video shows a crush simulation of the same foam microstructure as before. However, in this case the foam is confined on the sides and the cells are filled with air at atmospheric pressure. As the crush continues, the cells get pressurized and the rate of crush is slightly slower than for the previous case. The colors inside the cells show the gas pressure. Interestingly, none of the cell walls are pressurized enough to break. This indicates that there may be some numerical gas leakage during the crush process. However, that is hard to verify because of the thinness of the cell walls. Any pointers are welcome.